The Lamercraft “Kampfruppe 76” range is a small, though very beautiful range of white metal figures sculpted by Tony Boustead. They are definitely 1/76 and therefore difficult to mix with 1/72 figures, although here and there some might be just a tad larger. Packing is a plastic bag with zipper inside a sturdy transparent plastic box. The box contains a picture, as those below. Most figures are one piece, although some have separate items, like arms. All poses are very realistic. No decals are provided. Added to the series of figures Lamercraft also offers resin ammunition sets. Kit LC0001 - Fallschirmjäger set (5 figures) FJ laying demo charges , mix of tropical and temperate clothing. Suitable for the withdrawal from Italy or North Africa. Lively expression, realistic poses and very nice detail (like various insignia on the uniform). Minor amounts of flash need to be cleaned up. The poses are well suited for any scene where a staff meeting takes place. The detail is so fine, that you can even judge the rank of the figures from their shoulder-boards. -	1 figure in greatcoat holding binoculars. Subaltern. -	1 figure in field tunic and breeches, hands behind his back, holding a map case. Subaltern. -	1 figure in field tunic and breeches, holding a briefcase, and looking at his watch. Subaltern. All figures wear the officers belt with clawed buckle. The field uniforms are of the early war type, but as officers tended to keep these longer, they can perfectly serve for any period of the war. Lively expression, realistic poses and very nice detail (like various insignia on the uniform). Minor amounts of flash need to be cleaned up. The poses are well suited for any scene where infantry is seated on an AFV or Panzer and looking out for allied fighter-bombers. Some figures are relaxed, others worried, and one shouting out in fear. Due to the choice of uniforms, and the location of the eagle insignia, two figures are Wehrmacht, and three Waffen-SS, of which one in camouflage smock. 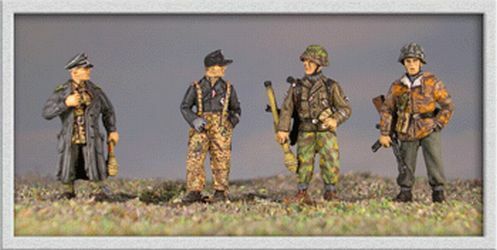 LC0005 US Tank crew set (5 figures)Mixed uniforms. Standing, one having a pee. Suitable for Ardennes or Italy winter 1944-45. Kit LC0007 - Waffen-SS Tank crew (5 figures) Standing and sitting. Mixture of panzercombi and shirt sleeves. Suitable for spring and summer 1943-44 especially Kursk. Lively expression, realistic poses and very nice detail (like various insignia on the uniform). Some flash and moulding “carrots” need to be cleaned up. The figures are in relaxed poses. What cannot be seen easily is that the sitting figures hold a canteen and cook put respectively, and that the upright figure, drinking, has partially undone his coverall, hanging on his waist, showing the SS shirt with sleeve-eagle. Kit LC0009 - British tankers prisoner set. (5 figures) British tankers in denim and Waffen-SS prisoners. Suitable for NW Europe or Italy. Lively expression, realistic poses and very nice detail (like various insignia on the uniform). Some flash need to be cleaned up. I can only trust Lamercraft on the correctness of the British figure, but they look good. Both have separate arm(s). Two of the German figures are in Field Tunic, with the eagle on the left sleeve. The other has either a very long smock and belt, or a short (standard) smock over a longer piece of unidentified garment. Although the picture (figure on the left) shows it painted as one item, this seems doubtful, as the smocks I have seen have no lower pockets and are shorter. My best guess is that the lower garment is a “Kharkov” Parka, as it has no visible zipper. Kit LC0010 - Waffen SS tank crew (7 half figures) Black uniforms. Suitable for all periods 1940-45. 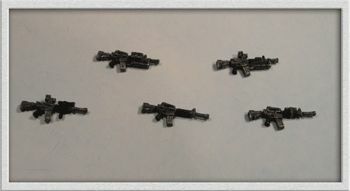 Kit LC0011 - M4 carbines set 5 basic, 10 variants with laser pointers, optics, including 5 with 203 launchers. 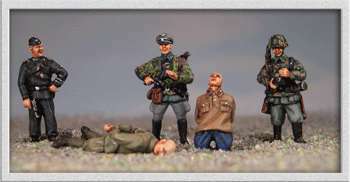 LC0012 Waffen-SS tank crew burial set (4 figures and grave) Mixed uniforms. Politically incorrect poses. All fronts except Africa .1940-1945. Kit LC0013 - Panzer grenadiers with wounded. (5 figures) “Kharkov suits” suitable for winter 1942-43. Lively expression, realistic poses and very nice detail (like various insignia on the uniform and vivid facial expression). Some flash need to be cleaned up. All figures are wearing the typical mouse grey “Kharkov” parka, typical for the Waffen-SS. One has a helmet cover, two are bare headed. One is tending a heavily wounded comrade, but is probably not a medic, as he is only holding a canteen. Kit LC0014 - German 75mm ammunition set. (46 parts) For Panther, Jagdpanzer IV L/70. Kit LC0017 - German 88mm ammunition set (49 parts) For PAK, Tiger II. Kit LC0018 - British infantryman with German prisoners. (5 figures) Mixed uniforms. Lively expression, realistic poses. Some flash need to be cleaned up. 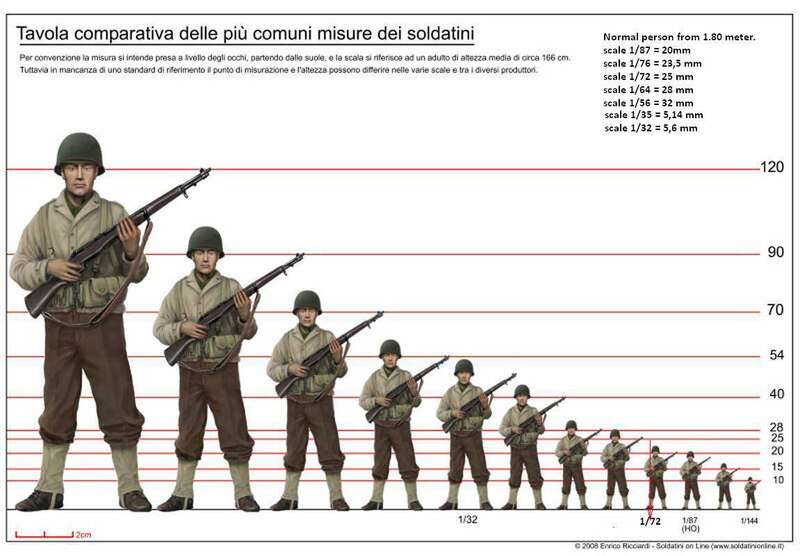 These figures seem a bit larger than other ones, and might possibly be mixed with 1/72. All figures are wearing a winter uniform and might be used as Heer or Waffen-SS.